We are all engulfed by the election mood, and the next interesting election would be for the 71-seat State Assembly or Council Negeri of Sarawak. The current term of the state assembly expires in late July. As usual people start playing “games” and conspire at every turn of events. Down and out in the Peninsula after having failed to deliver their March 2008 election promises the Opposition have been working hard for the assault on Sarawak. The attack has been narrowed down on the leader for obvious reasons. They are up against a time-tested leader with an impeccable track record and huge dosages of political wisdom. If you play a fair game, as it should be, the track record and the financial standing of the government of Sarawak alone would win majority support. But then again, it would be naïve to expect fair play in politics. Especially when there are those who are desperate for political power. Decades of economic supremacy have bred greed that knows no bounds, and now it hungers for political supremacy. Chief Minister Tan Sri Abdul Taib Mahmud 30 years at the helm is once again being propped as one of the voter’s main “issues”. Is this really so? His purported wealth has been ‘exposed’, to the extend that Taib could be looking for an island to hide his Opposition-created wealth and valuables. Going by Pakatan Rakyat’s aggressive accumulation of wealth for him, by the time the state assembly is dissolved, Taib Mahmud would have surpassed even Microsoft founder Bill Gates in terms of wealth. On the surface they say Taib must go because he has been there long but everyone knows that the veteran politician is actually PR’s greatest stumbling block. 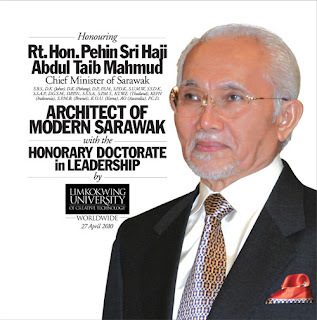 His politics of development has not only withstood the test of time but Taib, having served under all the Prime Ministers of Malaysia, has transformed Sarawak with his steely will. The results splashed everywhere that even the blind could see. It’s Taib’s leadership and his wisdom in commanding the BN team that they fear most. If you weaken the strongest link, the rest will crumble. The incessant attacks and character assassination on Taib has the hands and brains of a big chunk of disgruntled politicians and some propaganda-savvy foreigners. RadioFreeSarawak and Sarawak Report are just among their cowardly attempts. To a certain extend they created somewhat a ripple in the political circles but when the dust settled the Brown smelly thing and her puppydog came out on their own. Attempts to hoodwink the people through those dubious channels of communications are nearing the end with the rural folks spitting on their old transistor radios that, they say, have been telling lies lately. The enemies of the state have tried almost anything and everything, not sparing personal matters, but to date Taib is simply unassailable. His greatest strength is the BN government’s track record in Sarawak. Generally the people of Sarawak know that a bird in hand is better than two in the bush, even if the chameleon of a bushman claims to be “God sent” and promises two golden birds. Unlike the previous elections, there seems to be direct foreign interference in the affairs of the Government of Sarawak now and the coming state elections. This is a concerted effort to destabilise the state and unseat Taib and the move is fuelled by unfounded wild allegations. Desperation, they say (wonder if they have actually said it), knows no bounds. No stones are left unturned to formulate sinister, at times subversive, moves to isolate, attack and weaken Taib Mahmud. 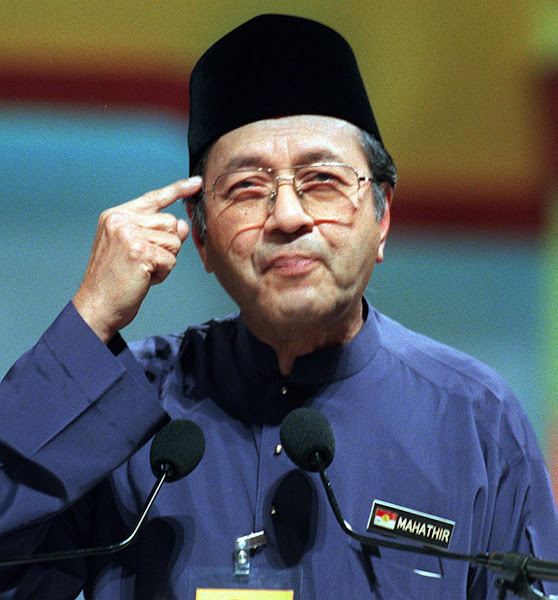 The patterns are similar to those employed during the 1998/99 Reformasi movement when the target was our then Prime Minister Datuk Seri (now Tun) Dr.Mahathir Mohamad. Expectedly Opposition politicians have denied any links with the FDI (foreign direct interference) in Sarawak’s domestic affairs. We shall let the people to exercise their wisdom on this. As their attempts fail one by one, the more subtle ones have started landing. Latest, in Kuching and Kuala Lumpur, there are people going around spreading lies that Prime Minister Datuk Seri Najib Razak has withdrawn his support for Taib. Basically it’s a desperate move to slip-in the idea that Najib is against Taib now, thus driving a blade deep into the heart of Barisan Nasional. Its yet another sinister move aimed at weakening BN by creating a rift or at least to plant seeds of suspicion among the leaders and supporters. An enemy divided is what they’re aspiring for now, especially when some among the BN are perceived to be weak and could easily turn their back in return greater power and position. The PR leaders, in particular Anwar Ibrahim would admit that for as long as BN is united with Taib at the driver’s seat, they would be better of just protecting the 8 seats they have in hand. 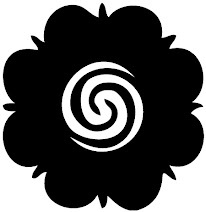 The next tsunami could just take away the bird in PR’s hands, and the God-sent bushman would be nowhere to be seen...his drums never to be heard in the open again. p/s Naming a successor is pertinent but, having travelled the arduous tracks and terrains since before Sarawak helped form Malaysia in 1963, I’m sure the tactful Taib has the necessary experience, understanding, and political wisdom to pick the right person at an appropriate time. ask yourself whether u are morally rightly to support a person like Taib when the people are suffering. I cannot believe you could stoop so low and defend a person like taib. Taib is no Mahathir Mohamad. where is ur sense? we don't want another husni mubarak tight grip on the land of the smiles. Areyou from Sarawak. 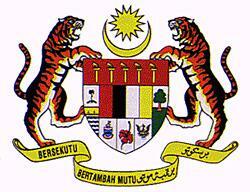 Spending there 5 years does not make you in the know on what is going on now in Sarawak. How long ago was it since you were last there. Please report the truth. Anonymous@What moral? Who cares about moral? MONEY is more important in this lifetime. Nampaknya Fuckatan pakai Claire Brown DAN Bruno Manser nak lawan seorang Malaysia-Melayu. Apalah. Saja setuju sangat line brooo:- Taib Mahmud ni has passed the test of time, kalau tak lama dah kena buang. Saya cabar Nik Aziz cuba bertahan selama 30 tahun, boleh ke tarak boleh? HEHEHE. You're an idiot, and OBVIOUSLY not sarawakian enough to know what his people have gone through. Stop polishing taib's balls, the rm10k he gave you wont last. fuckatan riot wants to cause riots in sarawak and divide the people. at the end of the day the fuckatan buggers would go missing after the election. who then takes care of the people? the chinaman in sarawak cannot be more stupid than to bet on a dying horse and risk all they have earned so far. the chinaman would be the biggest losers should the BN government be replaced by a bunch of power crazy lunatics. Anon3:04 - ksian makbapak kauu, anaknya bodo. 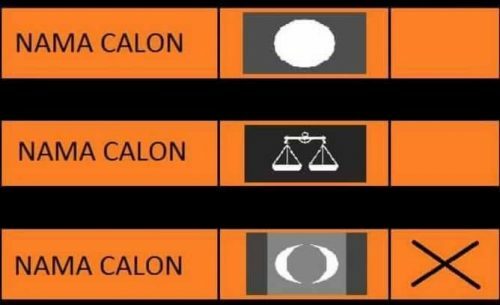 Mun pakatan tubuh kerajaan serawak, siapa calon ketua menteri. tak kan peter jaban dan matsalleh gila clarie brown kot. Peter Jaban mok jaga anakbini pun sik dapat. you are an idiot who spent 5 years attending Taib's PC and collecting door gifts here. How much have you been paid to write this rubbish. How well do you know Taib or Sarawak? 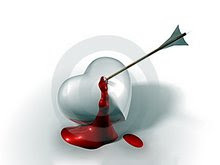 Why don't you come and live with us to know what should be ours but now we dont have. So you are a blind lapdog supporter of a man who for 30 years robbing the forest and the livelihood of my people and you say it's okay ? hey idiot.....does your religion teach you to steal and lie to the media ? btw are you indian or malay ? The quality of reporters is so low becos of idiotic bastards like you. shame on you and your family.ptuiii . Apai says - Glad that despite your blind hatred and vulgarity, you're still a 'proudsarawakian'. just be a little ashamed of yourself. Our dear beloved supreme leader Pehin Seri (Datos and Datuk Seris are too common for our dear leader)will be the chief minister of sarawak for the next 30 years more. PM Datuk Seri Najib should give him full support because he is the only person for the job. There is no way he can be defeated, the rakyat loved him too much and we expect our love for him will extend his life span until we become really developed and the rakyat truly supports him. We in sarawak all become rich because of him. His visionary and ideals made us the greatest state in Mlayasia. Because of him that we can put food in our table and raise our kids. We are so satisfied with his rule because of the wealth he brought to rakyat. Hell, without his help, we might still live in Niah Cave. This election we will ensure that he get all the support he needs. The rakyat still needs him to realise SCORE and making Srawak the developed state by 2030 where we could be expected to be all employed because of 2.5 million job opportunities created not to mention various oil palm plantations developed through his supreme vision. We believed that only through him that we could achieve greatness, right now we are are experiencing great strides in our standard of living all thanks to his divine works. When people say he is super rich, this are all lies. Taib is a very humble person just like you and me. Apa pun orang berkata mengenai ketua Menteri Sarawak tetapi bagi saya pernah berkhidmat di Negeri Sarawak pada awal tahun 70 an dan telah menjelajah semua bahagian bahagian negeri Sarawak termasuk kawasan pendalamam selama 15 tahun.Melihat keadaan dulu dan sekarang adalah amat berbeza. Ketua Menteri telah berjaya membawa Negeri Sarawak secara konsisten membangun negeri itu dan saya percaya Sarawak akan lebih maju dari negeri negeri lain menjelang 2020 hanya senario politik masih kekal seperti keadaan kini. Apa pun kerajaan BN negeri buat ia tetap ada orang yang tidak puas hati lebih lebih lagi ada kuasa luar yang main berperanan membuat agenda setting untuk kepentingan mereka. "It is better to trust the devil you know rather than to trust the evil you don't know". Bagi saya jasa Ketua Menteri amat besar kepada rakyat Sarawak cuma sekiranya ada yang tidak betul, bersatu perbetulkan nya. Jangan Jadi marah kepada nyamuk kelabu dibakarkanya. Bagi kawan kawan saya di Sarawak, Ketua Menteri akan bersara jua cuma besabar seketika sehingga Sarawak mendapat pemimpin macam kepandaian dan kewibawaan seperti Taib Mahmud. Selamat mengundi. a reminder to taib in the simple words of tun dr. mahathir to datuk samyvellu: you've been there too long man, too long...absolutely shamelessly too long. Menteri jaga longkang masih kosong mmmmm bagi apai Chong jak. BRO HOW COME THOSE COMMENTING IN YOUR BLOG ARE SO PERSONAL IN THEIR VIEW? KEEP IT UP BRO GUESS THESE GUYS ARE OF THE NARROW MINDED MORON TYPE. I HOPE THEY COULD ARGUE BASED ON FACTS AND NOT RESORT TO PERSONAL ATTACKS. BUT THAN AGAIN WHAT COULD WE EXPECT FROM MORONS WITH PEA BRAINS. THESE ARE THE TYPE WHOM MR.Y WOULD SCREW WITHOUT THEM EVEN KNOWING. GOD BLESS THEM. I assumed you are being sarcastic.